I experienced a milestone in my life this week. I turned 50 years old. I approached this day with trepidation. It is hard to celebrate a day which reminds you that you are getting older. Les and I are celebrating another great milestone this year. On Feb 17, we are celebrating 30 years of marriage. As this day approaches I am excited. I love reliving all the beautiful and challenging memories which make up this beautiful life we share. Both of these days mark the passage of time and are also a celebration of what life has been and what life has the potential to be. It is interesting that one day is viewed in a more negative sense and the other in a more positive one. Sometime ago I shared with a coworker about our 30 years and she told me of a couple she knew that celebrated 50 years of marriage by going to 50 places they have never been before. This lit a spark within me. When I shared this with Les, he felt the same spark and we knew this is the way we want to celebrate our 30 years together. So we are embarking on an adventure of going to 30 new places we have never been to before. We began with an easy one. 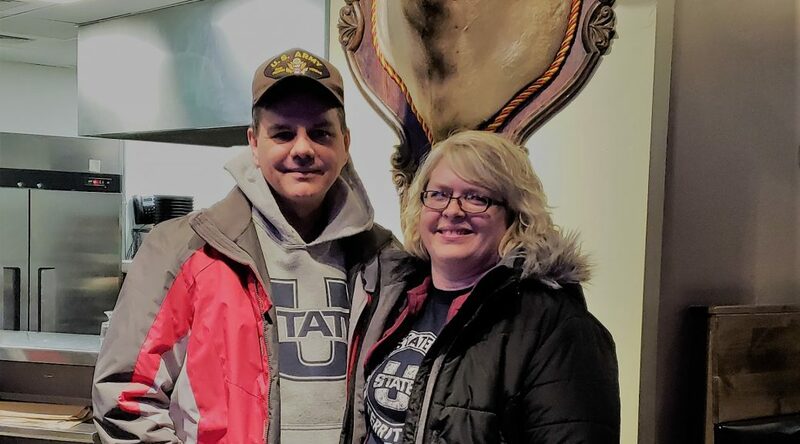 Last week before the Aggie basketball game we went to eat at a new place. Utah State University has a newer, really nice student housing complex called Blue Square. There is a food court at the bottom with a few places to eat. We ate at one of those restaurants called Bulls Head. We discovered a place with an energetic atmosphere, fantastic food, and a very personable staff. We had a very successful first adventure and are excited to see where our year ahead takes us.